It all began in 1974, when Marcos (Mark Brown), a 14 year old arrived in San Sebastian looking for magic. Donaciano López brought him here, the great-grandfather of Eliseo Ramírez (one of the people currently in charge of Khadi Oaxaca). Marcos stayed in the village for several years before deciding to travel to India. 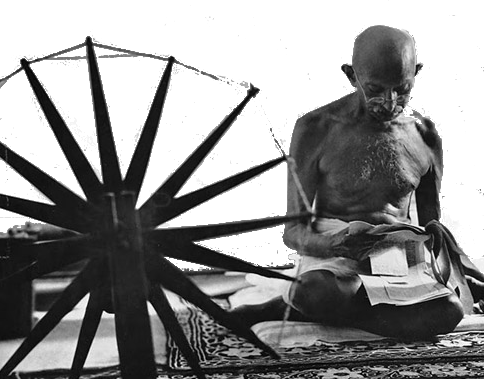 In India he spent many years and got to learn about khadi, the movement started by Mahatma Gandhi. He lived in Gandhi's ashram for two years (1986-88). THE WORD khadi REFERS TO A FABRIC, USUALLY COTTON, HAND SPUN AND WOVEN BY HAND. Gandhi's ideology grew beyond the fabric itself: he proposed self employment and self sufficiency for rural communities in India, cutting their dependency on Britain's textile industry. In the ashram Marcos learned to spin and weave and so he started wearing only the clothes from his own thread and fabric. He began living the khadi movement. Back in Oaxaca, in the 90's, Marcos brought a spinning wheel designed by Gandhi to San Sebastian and started teaching his family from the village (the Ramírez family) how to spin cotton with this wooden wheel. That wasn't difficult for the villagers, they are very good artisans and there's an old tradition in San Sebastian of spinning and weaving sheep's wool. In 2010 he established Khadi Oaxaca, a coyuchi cotton thread workshop, with more than 30 women from the village. Having the thread, other women began to weave.